Instead of buying blank books, Allison Rentz makes sketchbooks from recycled materials like plastic waste, trash, and discarded paper to write, draw and to work out ideas for projects. Since 2008, Fifth Planet Press has engaged her in PutAtoring, an ongoing collaborative book arts experiment, by distributing Allison’s blankish books to over 20 various artists, presenting the challenge to work in the books however they deem fit. Allison says, “When a person creates in one of my hand made books, they are collaborating with me.” The collection serves as a window into the various creative processes unique to each contributing artist. The books take on a life as they develop, and their future lies in the hands of a crew of contemporary artists. "I’ve held one of these monsters in my hand: Each book is a small, (sometimes nightmarish) dreamworld made of mixed media and all manner of irregular-shaped recyclables." ALLISON RENTZ is a metro-Atlanta artist who works in installation, performance, drawing, and multimedia. She is interested in how humans interact with each other, and with the environment. Allison's art has been presented in Atlanta, Athens, GA, France, Italy, Spain, Chicago, Lexington, KY, Texas, NY, and on the Web. Noted projects include "c o n t a i n i n g = h a t e," a performance installation at the Atlanta Contemporary Art Center as part of "Bring it on! A series of solo positions." Allison is the dictator of her own country--artempeerealism--where art is the law, and the law is art. She has been enjoying experimenting with music in the bands "Chinese Frankenstein" and "ASSTOW." 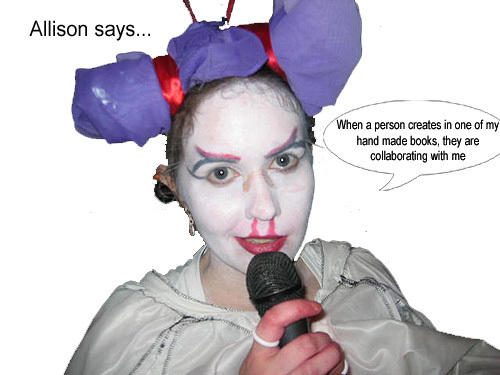 Collaboration has become a big part of her recent artistic practice. Part of my process of realizing projects involves making a book to work out my sketches and drawings in. In June 2008, Allison Rentz won the inaugural Idea Capital Artist Grant, which is a new grassroots initiative established to help jump start Atlanta-based, artist-initiated projects that might not otherwise be supported through mainstream arts institutions. Allison Rentz is an Atlanta based conceptualish artist. A graduate of UGA, Rentz has exhibited work at Eyedrum, Spruill Gallery, Downtown Arts Center (Lexington, KY), Polvo Art Studio (Chicago), and at venues in Beziers, France; Lecce, Italy; and Barcelona, Spain. She is also the founder of her own country, "Artempeerealism." To learn more about Allison's projects: http://www.allisonrentz.com. books are handmade with recycled materials. Book Launch at the Decatur Book Festival Aug 30th, 2008!! May 9th, 2009: Off Yr Rocker was a one night group show featuring work in the blankish books putAtoring by the artists below and performances by monomania, chinese frankenstein, and facehugger. We also showed Bean Summer's video component to the book: Information: Experiments in Digital Prints. August 31, 2013: Allison Rentz and publisher Nisa Asokanpresent a workshop on the artist book putAtoring at the eXperimental Writers Asylum program at the Decatur Book Festival.